Now a cult teen movie about a mopey guitarist with a hipster crush, forced to fight off her evil past. This comic book action/teen romance mashup is one of the most rounded teen movies there is. 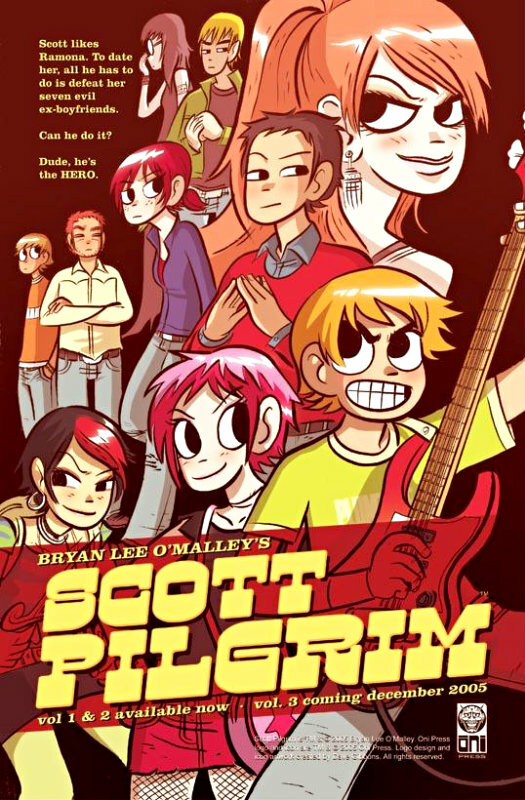 Based on the comic books by Bryan Lee O’Malley, the film follows Scott Pilgrim (Cera), a 22 year old band member born and raised in Toronto. He is unemployed, getting over a bad break-up and currently dating a 17 year old high schooler (Wong), which annoys his bandmates and most who know him due to his previous with females. Although this sounds bad, Scott is actually happy with his life, until a beautiful, mysterious girl appears in his dreams. He discovers the girl from his dreams is Ramona Flowers (Winstead), a girl with a chequered past who recently moved to Toronto from New York. Scott convinces Ramona to hang out with him and they eventually start dating. When they start dating Scott begins to discover more about Ramona’s dark past, and is warned that to date the girl of his dreams, Scott will have to defeat her seven evil ex’s. Art from the comic books written by Bryan Lee O’Malley, but can you tell who’s who? First of all, this is a film that cannot be taken too seriously. Having come from a comic book, there’s a lot in this film that would make no sense (or just wouldn’t work) in normal life, but that’s the idea. This can’t be treated like a teen-romance movie because of the lack of realism. There’s more in this film that leans to the fantasy/superhero genre than the cute, teen rom-com genre. The idea, in essence, is fairly ridiculous – having to fight your dream girl’s evil ex’s to be with her. If a young film writer suggested that to anyone they would probably be laughed out the door. This is why I think people by-and-large didn’t get Scott Pilgrim when it first came out, because it’s built on a completely fictitious idea. But when you think of it having come straight out of a comic book, the film makes more sense. The key to this film is the characters – all vibrant, colourful, exciting people that immediately grab your attention. Also the exciting visuals that accompany many of the fight scenes make them more fun and entertaining, and maybe disguise their lack of quality and actual content. But again, it’s from a fantastical teen comic book, so you would be wrong to expect blood and fist fights! This is a role tailor made for Michael Cera. The quiet, heartbroken, confused teenager is a role that Cera has mastered over the years, and he does a good job in this film. I personally think that the character should have been a little bit more confident overall in the film, especially compared to the comic books, but that’s probably not Cera’s fault. Mary Elizabeth Winstead is also very solid as the literal girl of his dreams, even though she has played much more emotive roles than this. Like in many teen films, most of the role are fairly simple emotively, and it’s the funny 3rd wheel that grabs your attention the most – enter Kieran Culkin. Brother of Macaulay, and Scott’s gay roommate in this film, he is consistently funny and performs all his lines like a seasoned comedic actor. You can tell in the tempo and pitch of his voice that he knows what he’s doing, and his character in general adds a sharp comedic edge to the whole piece. The directing by Edgar Wright is what makes this film special, in my eyes. He finds the perfect balance between being a regular teen movie and a comic book style action piece. While the (fairly rare) parts of the film where people aren’t flying about are not necessarily incredibly directed, Wright nails the lively parts of a very lively movie. He is also clever with annotations in the movie, whether it’s your stereotypical ‘Kapow’ during fights or clever little phrases for comic effect. While that’s probably not all down to him, he would have definitely had a say in it, so kudos for that! While recent films (notably The Hunger Games: CF) have made me question whether this is still my number one film ever – having recently seen it again I’m pleased to say this is still top dog! It is a genre-crossing, music rocking, feet kicking, heart pumping teen classic of our time, and you must see it! The only excuse for not seeing this is if you have a strong hatred for Michael Cera and his mopey teen roles, and then I would still suggest you grit your teeth and view it! 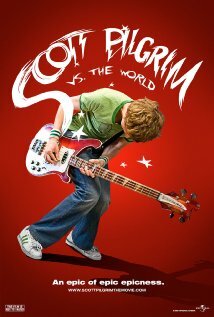 Seen Scott Pilgrim? Tell me what you thought! I would especially like to see how this went down with – dare I say it – the older generation, people who maybe can’t relate to the movie or characters. What did you think? It would be nice to hear from people who just didn’t click with this.